We filmed a short video for this recipe as well. Feel free to check it out below. For more videos, you can subscribe to my You Tube channel, so you never miss a new one. 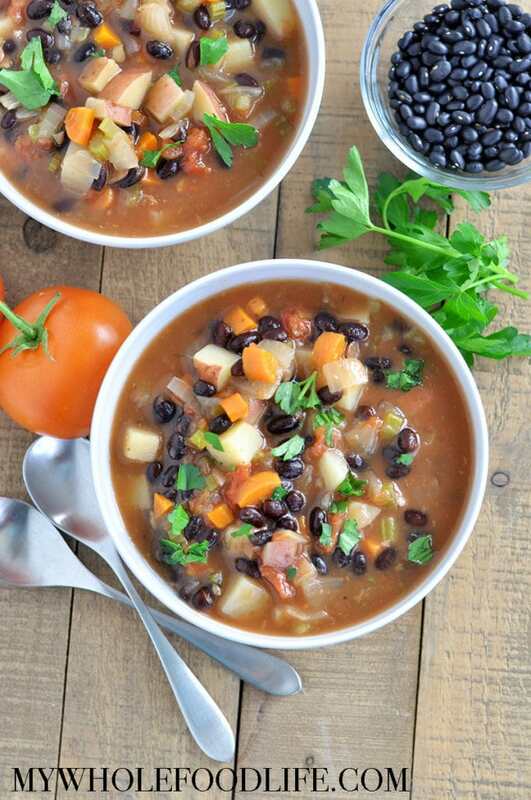 This healthy soup is filled with lots of veggies to keep you energized throughout the day. Vegan and gluten free. Put all ingredients in the slow cooker. Stir well and cook on high for 3-4 hours. This should last 4-5 days in the fridge. You can also freeze it for up to 6 months. Enjoy! Hi thanks for the great recipe. Any suggestions on how long to cook if I'm using the Instant pot and canned beans? Thanks so much! If I had to guess, I'd say no more than 5 minutes on the soup function. Yum! I can't wait to try this new soup recipe. Today is perfect - it's raining. Thanks for sharing! You're welcome Dani! I hope you enjoy it. This looks delicious. I am worried that as we are out of the house at work for about 12 hours it will be sitting (in stay warm mode) for too long. Any thoughts? How about cooking it on low instead of high? That may buy you some more time, but 12 hours to be away can be a big much. Is your slow cooker programmable? So you can switch it to warm for the last few hours? Thanks. I misread the recipe and thought that it was low for 4 hours. 8 hours of low and then warming mode should work greattach. I can't wait to try it. So glad you liked it Chrissy! Hi Melissa, instead of cooking it in slow cooker how would you cook it regularly on the stove? Thank you.